This weekend, I woke to a winter wonderland, only it wasn’t the snowy kind. It was a freezing fog. Winter fogs, so I’ve learned, are different from fogs that show up in other seasons. During winter, humid air moving over a cold surface can turn into fog. 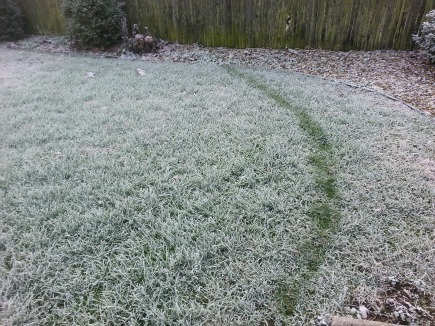 Additionally, freezing fog can form when cool air moves over warm, moist land. 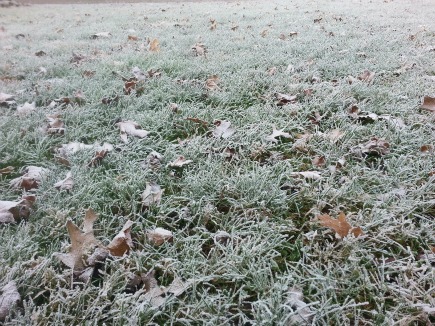 This kind of fog is also called hoar frost. I don’t know the meteorological terminology for what we had, but the weather forecasters said something about temperature inversion on TV. At any rate, it was stunningly beautiful. Dangerous to drive in. Potentially dangerous to walk on. But most festive to look at. Yes, the grass needs to be raked! Poor chrysanthemum is wearing a new colored dress! 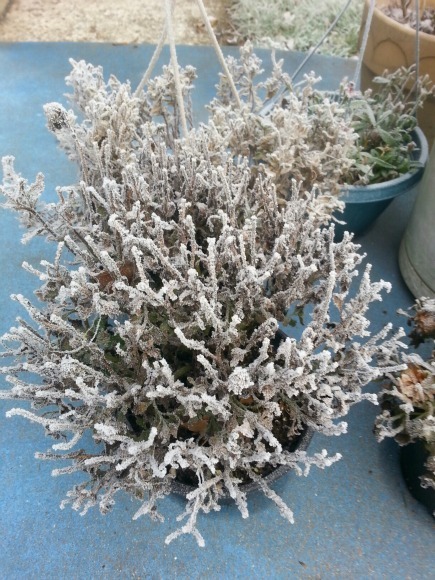 This entry was posted in Seasonal and tagged freezing fog, hoar frost, temperature inversion. Bookmark the permalink. Cooooold! 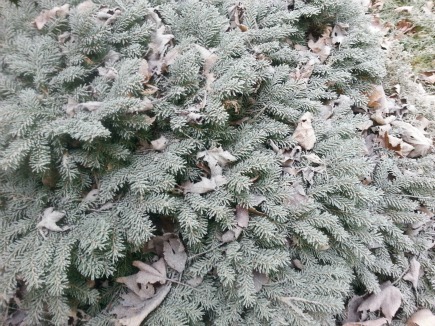 The fog left a lot of frost. Love the photos! Thanks, Cindy. Yes, it was indeed COOOOLD!!! Beautiful. We had an inversion around here last week that gave us fog (not freezing), clouds, and drizzle. It just means that the usual order of things (warm air near earth, colder air up above) gets inverted, and you have cold air near the earth and warmer air above it. 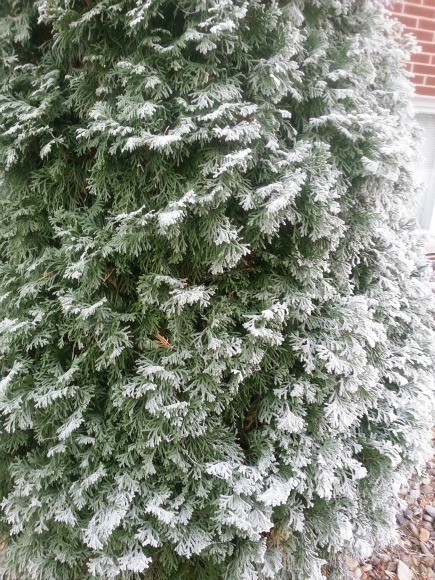 If there’s moisture in the warm air, it freezes as it falls through the cold layer. That’s how we got our Christmas eve snow a few years ago, and how you got your winter wonderland! The photos are just beautiful. Thanks for getting out and preserving the beauty for us! Glad you enjoyed the photos. And it’s a good thing I captured them early, for the entire beauty had melted by noon!! I remember this kind of thing when I lived in Illinois and Indiana. The fog is always beautiful and your photos are great. As you’ll remember, John, it’s pretty hard to get decent photos in a dense fog. The visibility is just too awful! I was lucky to get these — it had melted just a few hours later! Like you had someone come in and professionally flock your trees and bushes. Nature is so giving that way, right? Barb, I hate to think how much a professional flocking would’ve cost, ha! So yes, letting Mother Nature handle the task made it easier — and much cheaper! Debbie, you’re so right….it’s STUNNINGLY beautiful! Isn’t nature amazing? It creates some of the most gorgeous art! Have a super-duper Sunday, my friend! P.S. the picture of the chrysanthemum almost looks like sea coral! Glad you enjoyed my photos. Weather phenomena like freezing frost happen so rarely that one has to grab a camera and record them when they do, or you’ll miss them entirely. I haven’t seen anything cold in quite a while! Beautiful, Debbie. Aw, bless your heart, DD! 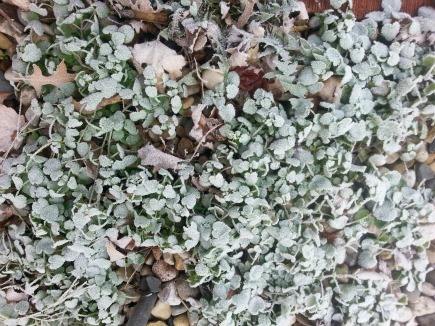 If I could’ve wrapped up some of the cold temps that accompanied our freezing frost, I’d have sent them along to you!! On second thought, they’d have probably melted along the way, so perhaps you just need a trip north?!! We’ll be flying to NY for New Years and I’m hoping for a small taste of winter! Sure is pretty though. I miss it — in theory. In reality, I’m a desert lizard. ;) Love the photos. I know exactly what you mean. I’d miss it, too, in theory, but I gravitate more to warm and sunny! Safe travels, my friend, but I’m sure we’ll “talk” before then! You’ve had more than your share of rain lately, haven’t you? Seems as if I read that somewhere. Anyway, fog is okay as long as you don’t have to get out in it. It’s bad enough driving here when the weather is clear; add a spot of fog, snow, or rain, and they become beastly drivers, ha! Very pretty! Funny how nature can be both so brutal and so beautiful at the same time. We had weather but it was bi-polar—within a span of an afternoon we had rain, sleet, snow, hail, fog, sun and finally a rainbow! We are up for rain and some thunderstorms later in the week. I cross my fingers that the temps drop low enough to save me from mud but if not that is what I have my trusty Hunter boots for. I think rain and mud are just awful, especially because it’s sooo hard having a long-haired dog in inclement weather! Dallas doesn’t like his raincoat, and won’t even walk in his boots. I admire you for what you do, considering how many different coat-types you handle! Everything really looked Christmas-y, for a few hours, Monica! I’m glad I braved the below freezing temps to capture a bit of it. Leave it to you Deb to teach this old gal something new. Thank you for the lesson and the beautiful pictures. Why, thanks, Tanya — always nice to learn I’ve helped somebody!! Now, it’s such an interest how Dallas walks. Look, it’s sorta like an arc. I like it. Thanks, Professor. I think he’d spotted a bunny by the fence and raced across the yard toward it, actually. Why the arcing motion, I haven’t a clue!